Heat oven to 180C/fan 160C/gas 4. Butter and line 4 6” sandwich tins with baking parchment. Beat the eggs into the melted butter, stir in the orange zest and juice, then mix with the dry ingredients till combined. 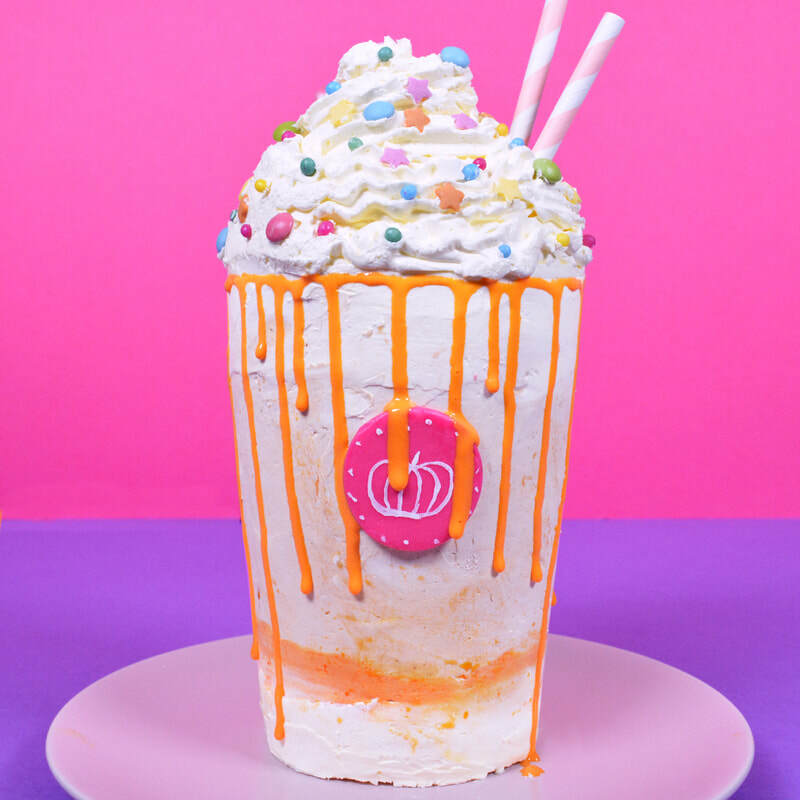 Stir in the pumpkin. Pour the batter into the tin and bake for 30 mins, or until golden and springy to the touch. When the cake is done, cool for 5 mins then turn it onto a cooling rack. Prick it all over with a skewer and drizzle with the orange juice while still warm. Leave to cool completely. In the meantime, make the buttercream, divide in half and add the espresso to one half mixing in well. 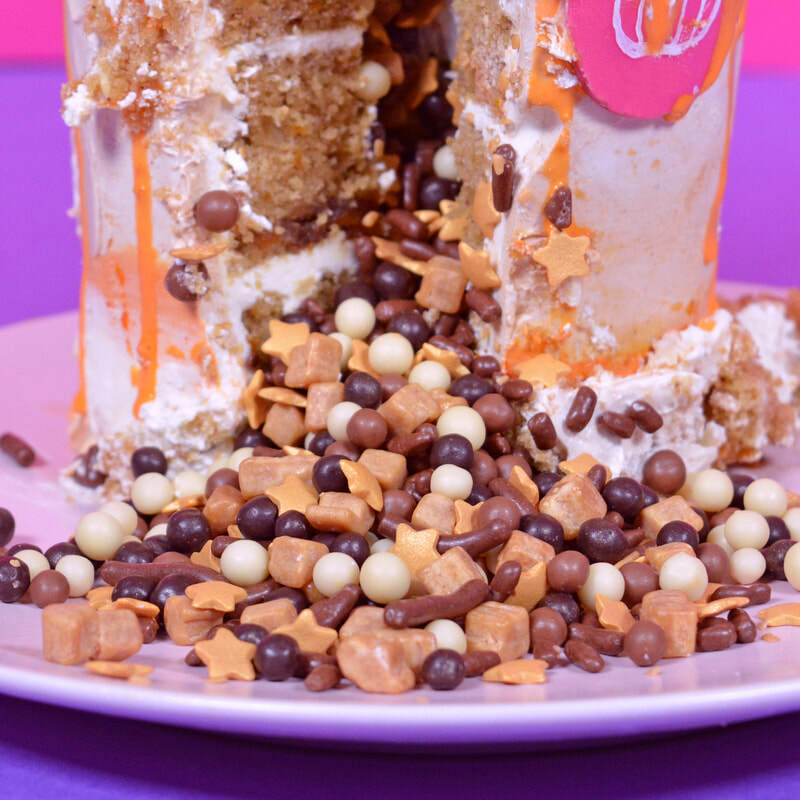 Cut discs out of three of the sponge layers, and stack together using the coffee buttercream, fill the hollow with Cake Angels Zillionaire Sprinkles and then top with the final sponge. Place the tower into the fridge to set up ready for carving. Once the buttercream has completely set carve the cylinder edges to make a coffee cup shape. Cover the outside of the cake with coffee buttercream. Top using a star nozzle with Vanilla Buttercream to create the look of whipped cream. Make the orange drizzle by combining royal icing sugar, water and orange food colouring. Decorate using Cake Angels Rainbow Sprinkles, some paper straws and an orange drizzle.